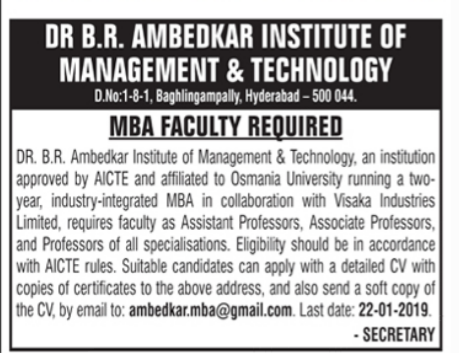 DR B.R Ambedkar Institute of Management & Technology, Hyderabad has advertised for the recruitment of Teaching Faculty- Professor jobs vacancies. Interested and eligible job aspirants are requested to forward resume on or before 22nd January 2019. Check out further more details below. About College:Dr.B.R. Ambedkar Institute of Management and Technology imparts quality education, where efforts are made to transform every student into an intelligent, caring, competitive, disciplined and a complete individual to overcome all challenges. The teaching inputs are guided by the principles of Wisdom, Attitude, Skills, Values, and Vision ( WASVV). As a result, the students are not just passive receivers of education but are trained to take up ownership of this learning and create opportunities to serve others. Dr.B.R. 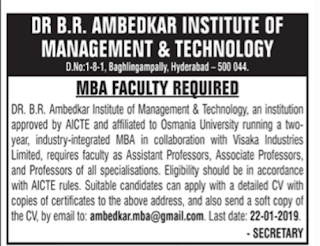 Ambedkar Institute of Management and Technology imparts quality education, where efforts are made to transform every student into an intelligent, caring, competitive, disciplined and a complete individual to overcome all challenges. The teaching inputs are guided by the principles of Wisdom, Attitude, Skills, Values, and Vision ( WASVV). As a result, the students are not just passive receivers of education but are trained to take up ownership of this learning and create opportunities to serve others. How to Apply: Suitable candidates can apply with a detail CV with copies of certificate to the college address and also send a soft copy of CV.